In 2008, some forest sleuths ferreted out a bunch of data about the trees in Atlanta. In a report released in 2014, the researchers reported that nearly 48 percent of the land within the city -- or more than 40,500 acres -- was covered by trees. Meanwhile, 22 percent was dedicated to vegetation such as grass and shrubs, and 30 percent was taken up by things like parking lots and buildings. To maintain the “City in a Forest” reputation, the Atlanta City Council in November 2016 updated the local tree ordinance to allow money from the city’s Tree Trust Fund to go toward buying forest land in an effort to protect the urban tree canopy. In honor of Atlanta’s commitment to preserving trees, we’ve put together an infographic offering some highlights from the 2014 research report. We’re going to go out on a limb and guess that you’ll want to rush out and plant a tree after you peruse our infographic. Or at least we hope so. If you’re a Atlanta resident looking for lawn service, check out our Atlanta, GA lawn mowing page to see how easy it is to schedule service for your home. This guide is brought to you by Lawnstarter Atlanta. LawnStarter provides convenient, easy to order lawn service throughout the Atlanta area. For more information about services near you, click on your city below. 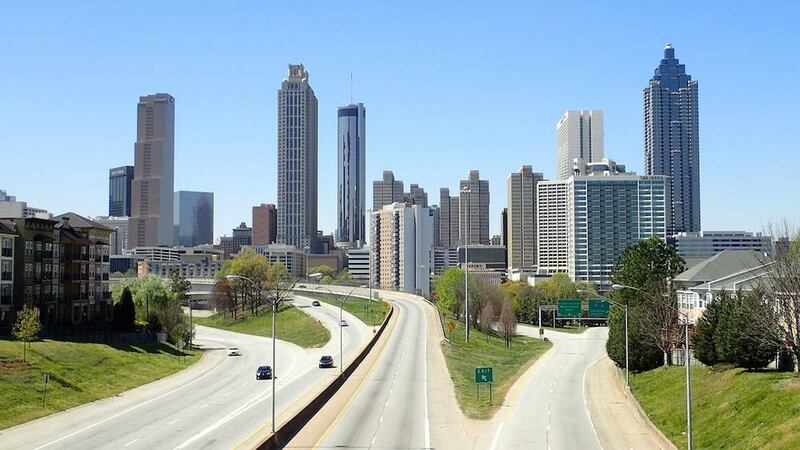 What Will Atlanta Look Like in 2030?